A young man was hit and killed in Norwood by a commuter rail train. According to the Boston Globe, the accident happened just before 5:00 p.m. near Dean and Washington streets. Our Boston personal injury lawyers understand that pedestrians fatally hit by oncoming trains is not an irregular event anymore. During the first five months of 2013, there were more than 356 pedestrians injured by passing trains. You might think that many of these accidents are caused by pedestrians — like trespassing or illegally walking near tracks. And you would be correct. However, federal authorities continue to point to far too many of the nation’s railroad crossings that are lacking proper warning equipment. The truth of the matter is that most — if not all — of these accidents can be prevented. It just takes a little bit of awareness and caution. First and foremost, it’s important that you stay off of the tracks. Walking or playing on railroad tracks or the right-of-way on either side of the tracks is trespassing. It is illegal and can be deadly. If you’ve got to cross tracks to get where you’re going, it’s important that you only do so in places where it is legal and safe to do so. This includes public crossing areas equipped with a gate, flashing red lights and/or a crosswalk. If you see a train heading your way, your best bet is so wait. You can never win against a train. The size, weight and power insurmountable. Even when there’s a tie, the train always wins. For most pedestrians, the problem with many of the trains today is that the “cliquey-clack” sound is no longer made. It’s also important to remember that trains don’t sound the whistle continuously. 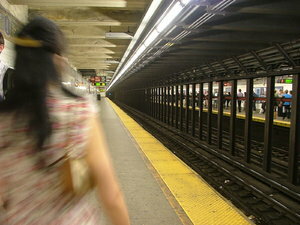 By the time a train’s operator sees you and sounds the whistle, you might not have enough time to react. This is why we can’t always rely on the sounds of oncoming trains to keep us safe. It’s our responsibility to be safe and aware near tracks. Once the train has passed, you may think you’re in the clear. Well, you’d be wrong. There may be a second train coming in either direction or on another track that you can’t see because the first train is blocking your vision. What you want to do is wait until the first train has moved so that you can see clearly in both directions. If there are flashing red lights at the crossing, never move until the lights stop flashing. Even if you are waiting a long period of time for the gates to open please be patient. If you suspect a signal is malfunctioning, call the 1-800 number posted on or near the crossing signal or your local law enforcement agency, which will notify the transit authority.